Nathan Lyon believes Pat Cummins is developing into one of the finest all-rounders in world cricket following his stellar display on day four of the third Test with India. Cummins returned career-best figures of 6-27 as the tourists declared on 106-8 at the MCG, setting Australia 399 for victory and a 2-1 series lead with one to play. That target looked well out of reach when Cummins came to the crease at 157-6, but a Test-best score of 61 not out meant he and Lyon (6 not out) at least ensured the match would go to the final day. "He's one of the best all-rounders in the game, in my eyes," Lyon said. "He's working his backside off with his batting with Hicky [Graeme Hick], who's a fantastic batting coach, and I know he did a lot of work while we were in the UAE. "It's great to see him get some reward and I'd love nothing more than for Pat to get his maiden Test match century tomorrow. He has been exceptional in this match and he keeps getting better every day. "I enjoy batting with Pat, he helps calm down my nerves and it was an exciting challenge. It was a pretty special knock from him. "He is a great bloke but an even better cricketer. Seeing where he started from and seeing where he is now, he has a hell of a long career ahead of him. "We are going to win the first ball in the first over, and show a lot of fight and pride in playing for Australia. And we will enjoy doing that." 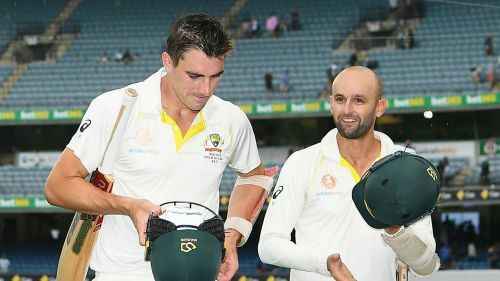 Cummins' heroics came after Australia's top order struggled once more, with the likes of Shaun Marsh and Travis Head failing to build on starts while Aaron Finch (3) posted another low score. "I see how much hard work the guys are doing in the nets and in training," said a defiant Lyon. "We know they are working hard and not going out to fail. They have all my support. "We are up against a world-class bowling attack, one of the best Indian attacks I have ever seen. They are disappointed but I know how hard they are working. Success for them is around the corner. "I am a massive fan of Aaron Finch. He is working hard and seeing a lot of balls in the nets. We have seen him in international cricket in all three formats as a world-class batsman. He is as disappointed as anyone else is."